Pre-bolusing insulin is when you take insulin at a set timeframe before eating, giving the insulin time to become "active" and combat the blood sugar rise. Pre-bolusing takes some practice, and there are variables to contend with that influence outcomes, like a delayed meal, a child who refuses to eat, or a low blood sugar before a meal. But practice makes perfect, and even with some variables in play, pre-bolusing can help improve overall blood sugar control. 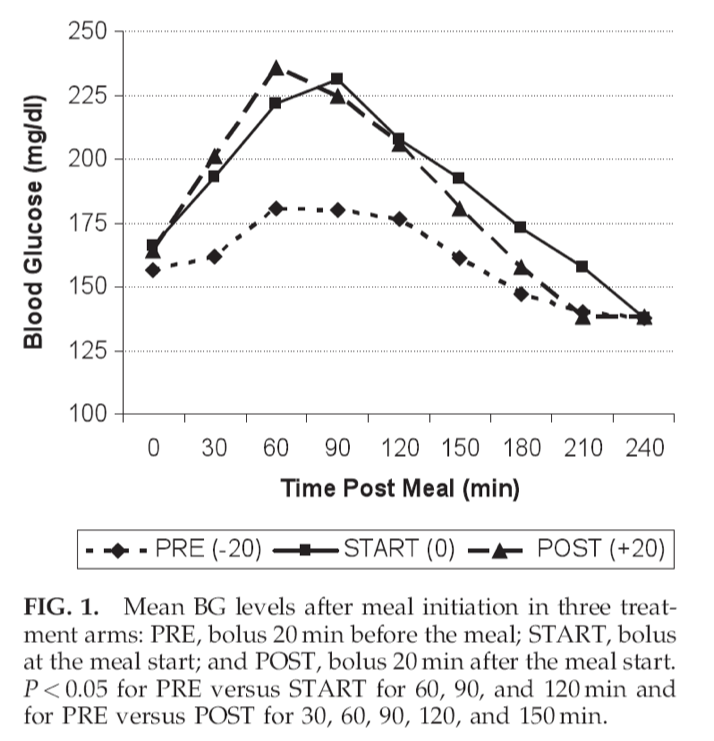 According to a study from 2010, “A bolus of rapid-acting insulin 20 min prior to a meal results in significantly better postprandial glucose control than when the meal insulin bolus is given just prior to the meal or 20 min after meal initiation." Pre-bolusing works well if you get the timing right; some people only need to bolus 15 minutes before eating, others may need 30 minutes. You'll need to experiment to find the timing that works best for you. For people dealing with gastroparesis, trying to predict the absorption of food can be complicated. Talk with your diabetes care team for guidance. The impact of pre-bolusing is clearly shown in this graph from a study published in 2010. Trial and Error - Finding the right timing for your pre-bolus takes some experimentation and patience. Document your trials and learn from the data. Look for Patterns - Are your post-prandial blood sugars spiking up high after a meal? You may need to pre-bolus a little earlier. Is your blood sugar going low after a meal? You may be bolusing too early. Make Sure Your Ratios Are Right - Fine tune your insulin-to-carb ratios and also your sensitivity factor so that you can pre-bolus with precision and confidence. Ask Your Diabetes Team - Do you need more help with the timing of your insulin doses? Check in with your diabetes care team for their guidance and advice. "How important is pre-bolusing?" A Q&A from our DTeam.